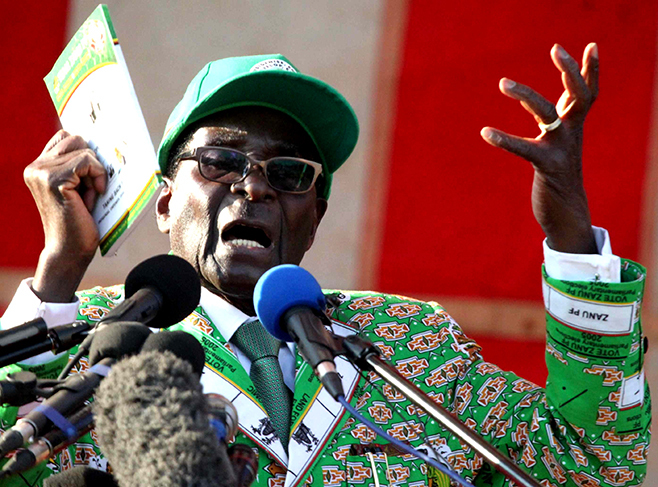 ZIMBABWE – The more I think about it, the more convinced I become that President Robert Mugabe is a fake revolutionary. A myth has been snow-balling over the decades that he is a dedicated and brave fighter for black emancipation, a passionate pan-Africanist and a man who has his people at heart. Because of this myth, he has earned himself a lot of admirers here in Africa and in other parts of the world. They hail him as a freedom fighter who has selflessly fought for black freedom and continues to do so even in old age. That is hogwash. Mugabe is nothing but a smooth-talking opportunist who has hardly walked his talk. All those who are smitten by his populist pan-Africanist fundamentalism must pause for a moment and think about how he entered politics to start with. Mugabe was an outsider more concerned with his books and the classroom when some excited nationalists decided to thrust him into the centre of the struggle in 1960. There is no evidence that he ever had any intention to actively participate in the anti-colonial fight until then. In 1947, he was a 23-year-old teacher at Hope Fountain but he never stepped outside the school fence to join others in protests against colonial rule. That was when black nationalism was gathering momentum and many young men were already engaging in trade unionism and other forms of protests. Not him. His job mattered more than anything else. There is no evidence that he was a passionate revolutionary during his stint as a student at the University of Fort Hare in South Africa. Between 1913 and 1959, the university grew a formidable alumni of nationalist revolutionaries. These include Nelson Mandela, Julius Nyerere, Robert Sobukwe, Desmond Tutu, Kenneth Kaunda and Seretse Khama. While all these, Mugabe included, went on to lead formidable movements against colonial rule in their respective countries (and formed the Organisation of African Unity and the Frontline States) they can easily be distinguished from our own president. Their activism was evident even during university days, while Mugabe remained aloof. Unlike the typical nationalist, he did not take part in active politics as a student. That was the usual who, during his young days, would remove the family herd of cattle away from the other boys and spend hours alone. Again, instead of remaining home and joining others in the struggle against white rule, Mugabe decided to go to Takoradi, Ghana, to continue with his teaching career. Over the years, he has been busy rapping various individuals for running away from the war. This is dishonest on his part, seeing that he did exactly the same when he went out of the country at a time when his generation was taking to the streets and organising protests. It is clear, therefore, that his country and the people were not on his list of priorities. There were many Zimbabweans who also went out of the country – but they were notable for their activism either as students or political plotters. No-one knew Robert Mugabe before he came back to his country in 1960, and that is because he was not interested in politics. His job was more important than the freedom that he jaw-jaws about almost every day now. The manner in which he finally entered politics shows nothing about a man with a passion for the pan-African ideals that he preaches about. He was on holiday and had come back to this country to flaunt his Ghanaian wife, Sarah Hayfron, who we fondly remember as Sally, may her soul rest in eternal peace. It so happened that nationalist activists like Enos Nkala decided to take him in because they had noticed how eloquent he was. It took some effort to persuade him to join the nationalist movement, though. He had come over as a passer-by, a mere spectator. Joining the struggle was the last thing on his mind. He had always planned to go back to his newly-found home in Ghana. Were it not for the likes of Nkala, we would still hardly know this man called Robert Gabriel Mugabe. He got into politics purely by chance and must be seen as an opportunist. When he was made leader of ZANU as the armed struggle gathered momentum, he remained practically on the periphery. Outside the “heroic” walk from the then Southern Rhodesia to Mozambique where he was to lead the war of liberation, Mugabe was a tent man. Not on a single day did he step out into the battlefield. He gave all the orders from the comfort of an office. I am cocksure that the man has no idea how to strip a pistol. Who his admirers, genuine and false alike, describe as a brave revolutionary is in fact a man who has been loudly repeating the ideals that he adopted too late in life. He has discovered a mysterious sweetness around these ideals and, like a mad man who managed to grab the baton, he has fled with them into the wilderness. But he is mostly talking rather than living those ideals. I don’t understand how he could be a serious pan-Africanist when he is not even pan-Zimbabwean.